R. M. Singh, IPS, Chairman, Assam Police Housing Corporation has been transferred and posted as Director General of Home Guards and Commandant General of Civil Defence, Assam. Anil Kr. Jha, IPS, Special Director General (CID), Assam is transferred and posted as Chariman, Assam Police Housing Corporation vice R.M. Singh, IPS, transferred. K. Sinha Casshyap, IPS, Add. Director General of Police (T&AP) is promoted to officiate in level 16 of the pay matrix is promoted as Special Director General (T&AP), Assam. Bhaskar Jyoti Mahanta, IPS, Add. Director General of Police (Border) is promoted to officiate in level 16 of the pay matrix is promoted as Special Director General (Border), Assam. R. Bishnoi IPS, Add. Director General of Police (Administration) Assam is transferred and posted as Add. Director General of Police (CID) Assam. Harmeet Singh IPS, Add. 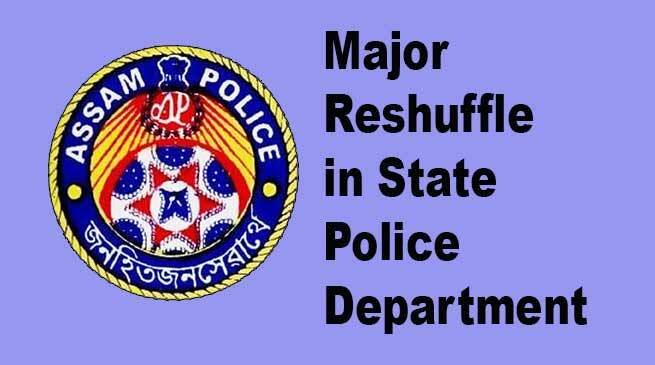 Director General of Police (Security) Assam is transferred and posted as Add. Director General of Police (Administration) Assam vice I.R. Bishnoi IPS transferred. He is also allowed to hold the additional charge of ADGP (M&L) and ADGP (Security), Assam in addition to his own duties.